The ALBA-1 undersea cable was installed by a joint venture made up of Alcatel-Lucent Shanghai Bell (ASB) and Telecomunicaciones Gran Caribe (TGC). TGC is itself a joint venture between the Venezuelan and Cuban governments. 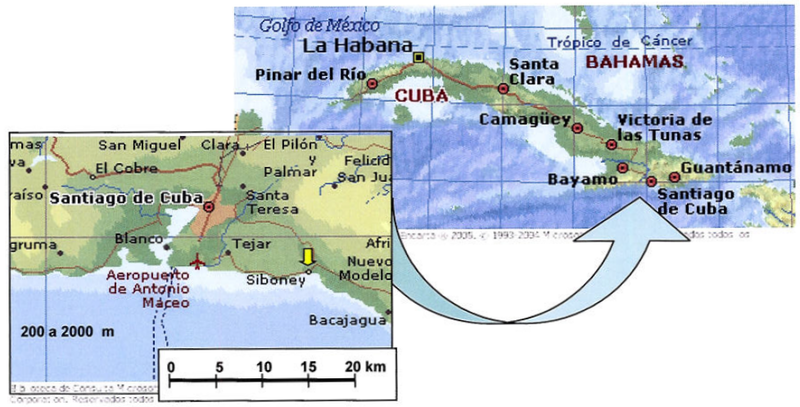 It is 60% owned by state-run CVG Telecom (now Telecom Venezuela) and 40% by Cuban Transbit. Wikileaks has a slide deck and four background documents on the proposal and contracts. The slide deck, entitled "Cuba-Venezuela Submarine Project Benefits 2/2," is part of a sales pitch comparing the ASB proposal to a competing proposal from Huawei. They stress their position as a one-stop vendor with their own fleet, experienced people, and superior cable and repeaters. The embargo is also an issue. ASB emphasizes freedom from embargo conflicts arising from US patents in the equipment Huawei proposes using. They also point out that a US company makes the power feed equipment used during cable laying and repair operations in the Huawei proposal. (I could not find Part 1 of the presentation). Service agreement for the operation of the international telecommunications between ETECSA and CVG Telecom. Documents released by Wikileaks reveal that Cuba and Venezuela signed a confidential contract in 2006 to lay an undersea fibre-optic cable that bypasses the United States. The cable is to be completed by 2010. The contract between the two countries, which has been independently verified, adds weight to Cuban statements that the United States economic embargo of the island has forced it to rely on slow and expensive satellite links for Internet connectivity. Cuba is situated a mere 120 kilometres off the coast of Florida. The proposed 1,500 kilometre cable will connect Cuba, Jamaica, Haiti and Trinidad to the rest of the world via La Guaira, Venezuela. Carrying out the work are CVG Telecom (Corporación Venezolana de Guyana) and ETC (Empresa de Telecomunicaciones de Cuba). Increase interchange between the two governments. Foster science, cultural and social development. Increase the volume and variety of relationships between country members of ALBA (Bolivarian Alternative for America) and the South American MERCOSUR trading block. Help serve the increasing demand of commercial traffic between Cuba, Venezuela and the rest of the world. The contract parties state that given the diversity of foreign affairs, they wish to build a new international order, multi-polar, based in sustainability, equity and common good and that an international cable with maximum security protected by international organizations (ITU/ICPC) is crucial. The documents disclose plans to separate commercial traffic and governmental traffic upon data arrival. We now know that the planned schedule shown below was overly optimistic. The cable was not operational until 2013. There has been speculation on the causes of the delay, but one cannot overlook finances as a contributing factor. A subsequent Wikileak document on a meeting of financial officers from several Cuban embassies, including China, reveals frustration over Cuban debt. The goals listed by Assange have not yet been achieved either. Again, part of the explanation for that is financial -- the government cannot afford domestic infrastructure to complement the cable and foreign investors are not willing to come to Cuba. One way to pursue the goals Assange lists would be to focus on key sectors like education and health care.